As part of the Borough’s responsibility to oversee and regulate certain activities and to provide for the harmonious development within the community, permits are required in order to undertake specific actions. Some permit costs vary with the size of the project, while others are set at a fixed fee. The following list is not all inclusive, but provides examples of the type of actions where permits are required in Glen Rock; for further information, contact the Borough Office. What do I need a permit for in Glen Rock? 2 – Open burning (except a fire pit) requires a Burn Permit. The cost is $20 for an annual permit. 3 – PODS or any similar temporary storage container not on on private property requires a permit. The cost is $25. 4 – Dumpsters temporarily placed on public property or roads requires a permit. The cost is $25. The Zoning Officer and Building Code Officer is responsible for the issuance of building and zoning permits, arranging inspections of construction sites, review of site and construction plans, inspection of rental properties, and enforcement of all building codes and zoning ordinances. Glen Rock Borough has a contract for these services. The zoning ordinance is available for viewing in the Borough Office. See below for additional information. Note: If you have any questions about whether a permit is required, call the borough office. DO NOT CALL THE ZONING OFFICER OR BUILDING CODE OFFICER DIRECTLY (you will get billed if you call without going through the Borough Office). Before starting your project, get all needed permits! Download the appropriate permit applications below. Contact the borough office if you are unsure which forms you need. The Workers’ Compensation Form is normally required with Building and Zoning Permit applications. Fill out the application(s) in detail. 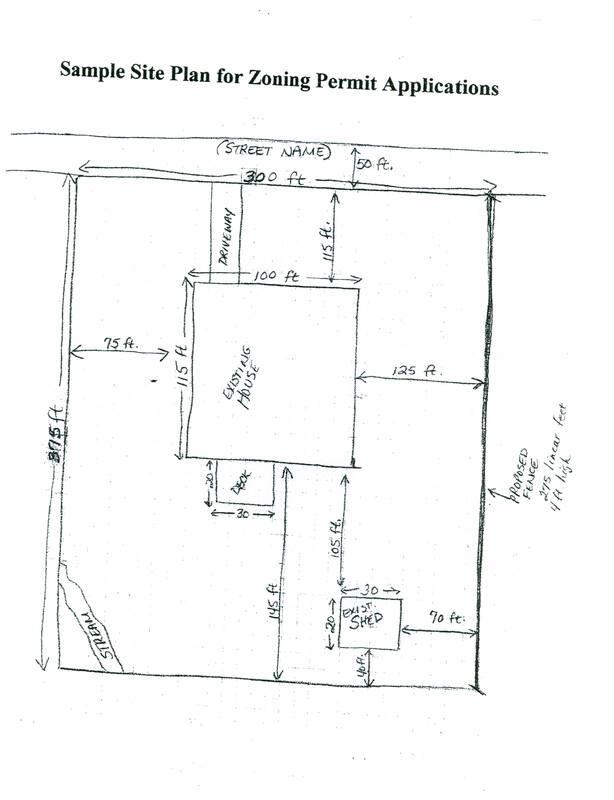 A sample Zoning Permit site plan may be downloaded below. Bring the applications to the Borough Office for processing. The Zoning Permit fee is due upon application for the permit. Building Permit fees vary depending on the type of project and number of inspections required. A Building Permit plan review fee is due upon application for the permit. Additional fees for inspections will be due and payable when the permit is picked up from the Borough Office. You will be notified when your permit is ready for pick up from the Borough Office. Any additional Building Permit fees will be due at time of permit pickup. Once the project is started, contact the Borough Office for inspections (24 hour minimum notice required). “**”These permits are relatively simple and require a shorter approval process, all within the borough office. Download these forms, fill out the application(s) in detail, and bring them to the borough office for processing.